If you have trouble deciding exactly what you can do on specific days you may be interested in a new activity forecasting system which is being created by Romulo based in Miami Florida. Watch the video below to learn more about the small device which is capable of continually monitoring all relevant data and providing an activity forecast for the week or day of your choice. We all have the same problem of having too many websites and apps to look up when we want to go out and do our favorite activity. Should I is here to help answer the question “Should I go golfing today?”. Our product will take into consideration the available data and spare you from having to analyze it. The goal behind our recommendation engine is to aggregate all of the data that pollues our daily lives and provide a clean output that just gives us the recommendation. The Should I Activity Forecast works by pairing an always on, battery operated Home Display to our free, intelligent cloud service. We let the cloud absorb the data and make the decisions to then show you which activities you should do with an easy to understand icon on the Home Display. Creating a cloud intelligence also allows us to take this one step further and give you a weekly forecast for your favorite activities. Today we may have to look up several data sources to decide on the best time and date to go do an activity and then repeat those steps in case schedule supports alternate days. We’ve built the Should I recommendation engine to do all of that for you without needing any additional user input. It becomes even smarter as we receive your feedback to fine tune the recommendation and, through machine learning algorithms, automatically improve the algorithm based on user feedback. 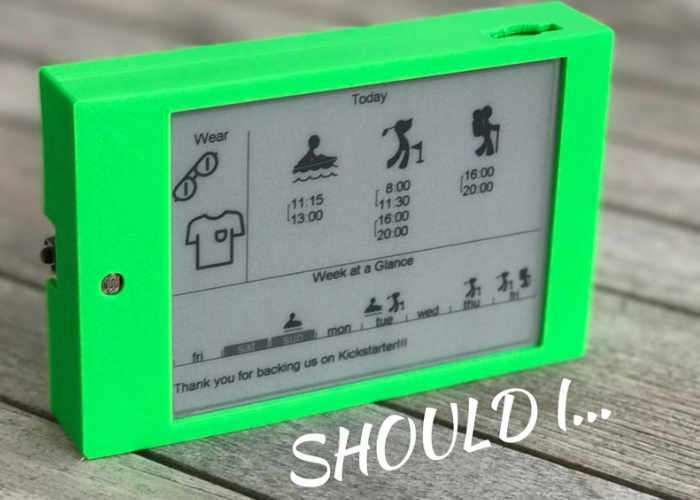 More details on the innovative activity forecasting system jump over to its official Kickstarter campaign page by following the link below.